I’m very happy indeed to be today’s host for Margo Wilson’g virtual book tour with The Main Ingredient. This is a very enjoyable book to read. For those who like to genre-alise their books then I suppose ‘cosy mystery’ is where this fits best, but I rather cringe to use that term. It doesn’t do the books that fall into it justice because, like The Main Ingredient, they are thoughtful, intelligent and subtle, with touches of humour and deep, fascinating characters. There may not be the murder or multi-million dollar fraud or threat to world peace on every page which mainstream thrillers seem to demand, but cosy mysteries reflect real life far more closely. Petty rivalries and relatively minor incidents can become all-consuming and dangerous when you’re caught up with them. In this story, West Coast food editor Wendy Whitby returns to her home town of Weewampum to be with her dying mother. But her stubborn mother is determined to prolong this as much as possible. To keep her busy, Wendy helps old school friends Amber and Merribeth with their newly-opened restaurant, Amberosia’s. Amber and Merribeth are almost polar opposites in terms of personalities and Wendy fits in somewhere in-between, giving us an intriguing trio of heroines. Local politics rears its ugly head as a proposal is made to move the hospital from its current downtown location so someone rather fancier. This will be the death of the downtown area so many residents oppose this idea and make Amberosia’s their headquarters. This brings the restaurant into the centre of attention, so when it burns down, then it seems clear it wasn’t an accident. The Fire Marshal believes that too, only he’s convince that the trio did it themselves to get the insurance money. It’s look rather grim for the girls so Wendy spearheads a campaign to find out the truth. However, this stirs up a hornet’s nest of old grudges and skeletons in cupboards and several people have to make hard decisions. There is a lot of depth and humanity to this novel. It’s a joy to read, and there are tempting recipes to try too. Author Margo Wilson has always had a very active imagination and soon learned that words have power and beauty. 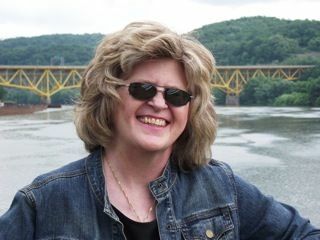 This led her to polish her creative writing skills and as a result, she landed a job teaching writing at California University of Pennsylvania and snagged a book contract with Ramsfield Press. She’s currently working on a memoir about travel and taking a journey, and a series of novels about a dog who … well, let’s all she’ll tell us. Although she grew up in Wisconsin, Margo has lived in Indiana, Canada, and California. She makes her home in Southwestern Pennsylvania, with her menagerie of animals.